Even if PUBG Mobile is available for free to play on both Android and iOS platforms, the game comes with a season based Elite Pass system that players can buy within the game after paying the given amount and avail additional benefits and perks. Now, with the latest update (version 0.11.5) of PUBG Mobile, Tencent Games has added a new membership feature called Prime and Prime Plus. Both the subscriptions were earlier available for a few countries and now the company has enabled this feature in India as well. The new subscription systems will allow players to earn Unknown Cash (UC) as a daily bonus, discounts and convert the Battle Points (BP) to Unknown Cash (UC) and purchase items. 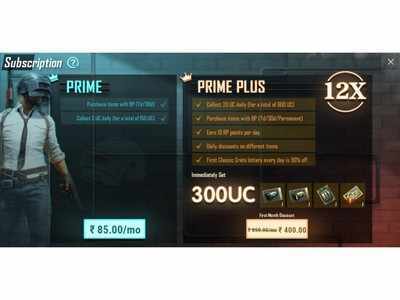 Players can purchase the Prime and Prime Plus subscription within the game. For the first month, Android users can get the Prime subscription for Rs 85, while iOS users have to pay Rs 79. On the other hand, for Prime Plus subscription, Android users will have to pay Rs 400 for the first month and Rs 799 after that. While iOS users will be spending Rs 16 more in the first month and Rs 50 more after that. As mentioned above, the Prime members will get to purchase items using the BP and along with that, they will get 5 Unknown Cash daily. Prime Plus members, however, will get a total 600 Unknown Cash in a month along with the ability to purchase the items with BP. They will also earn an additional 10 RP points daily. Apart from this players will Prime Plus subscription will get an additional discount on items as well as 50 per cent off on their first classic crate lottery every day. Giveaway: Win a pair of BoseBuild Bluetooth Headphones!